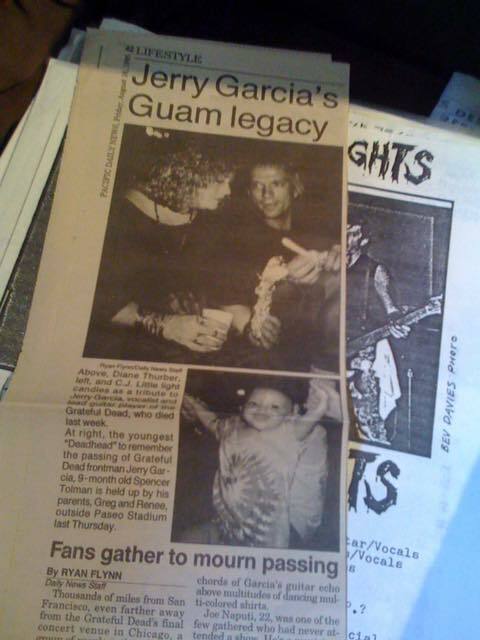 When living on Guam (1993-96 ish), i had 3 jobs – along with selling my hemp bags and flower sticks. Also led snorkelling group sessions to help pax understand how to wear and clear a mask, avoid coral, identify some fish and go in the appropriate direction to avoid fighting current. Due to slippery rocks and jellyfish, this also involved lost of first aid – some quite grisly. I’ll spare you. Sometime groups would stay over and i’d be paid to eat my weight in sashimi (granted i was pretty skinny then), entertain with fire juggling, pretend to understand mah-jong and take photos – then sleep in hammock or tent. Sometimes the groups were filming TV shows and so somewhere out there, I am in the background of various mini-series rom-com dramas. Not to mention all the family vacation photo albums in which i make a thin but tanned appearance. Guam is a quick 3-ish hour flight from Japan making a for an easy and decadent weekend getaway. Most guests were honey-mooners, some families, company groups and lots of 20 year olds enjoying a brief reprieve from the pressures of education and work to celebrate their seijin shiki (coming of age day). Most all came in organized tour groups and then would purchase “optional tours” including the private beach day, at hotel tour desks. Other activities (besides submarines and scuba diving) included duty-free shopping, “massage” parlours and gun shooting ranges. Anyhow, my co-workers worked the “bad boy” image pretty hard and acted like smooth operating beach toys (with much success plying dates for after work) whereas i was the (almost shockingly) “good-ish boy” hanging out with the folks interested in history, poetry and practicing my Japanese skills. Mostly. The beach club was run by a corrupt as fck family who controlled liquor and tobacco concessions for outer islands. A weird trio of bosses who were never on the same page and constantly overirdiing each other on decisions and appointing relatives as “managers”. They also imported grunt labor from Truk/Chuuk island and paid them seemingly in booze. They lived on site in shacks and raked the beach and other odd jobs. The club was sorta landlocked with the only access being through Andersen Air Force base (yes the one in the news recently regarding DPRK’s ambition s to bomb it) which accommodated all sorts of planes (Stealth bomebrs, Concorde and those big transport planes, plus FedEX planes bringing in fresh meat and produce to stock the base stores). Post-9/11, the base shut down the thru-access required to bring guests in and, as such, the club was closed. I imagine there are some squatters there enjoying the pristine yet rugged location noted for the “sand” which was really broken up pieces of coral resembled stars. Not sure of the current situation there and because this was before the advent of “consumer internet” there isn’t much record of evidence. Every few years, i’ll from another former employee or another who’ll dig into the internet and come across my snapshots. There are some photos out there from the last few years (i think from the part of the club made for the Korean guests as the K & J’s had a hard time getting along so became prudent to separate oddly) but could be from another beach with star sand. If you have intell, please let me know. 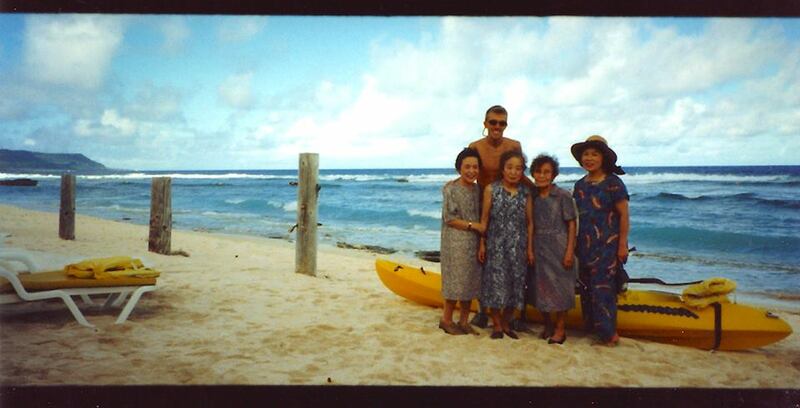 Like this evidence: Here i am plying my trade with a quartet of lovely Japanese ladies enjoying an idyllic day on the beach. NOTE: Snap taken with an early generation Japanese panorama camera but developed on “normal” size resulting in black bars (mostly cropped out) on top and bottom of print. So wanna hang out while i share a load of artifacts from #Guam? The unincorporated territory of the US is in the news what with global sabre rattling… I lived and worked on Guam in the early 1990s in various tourism endeavours and have much knowledge of the place as i stay sorta up to date with news of various Micronesian islands (#hideawayplans). 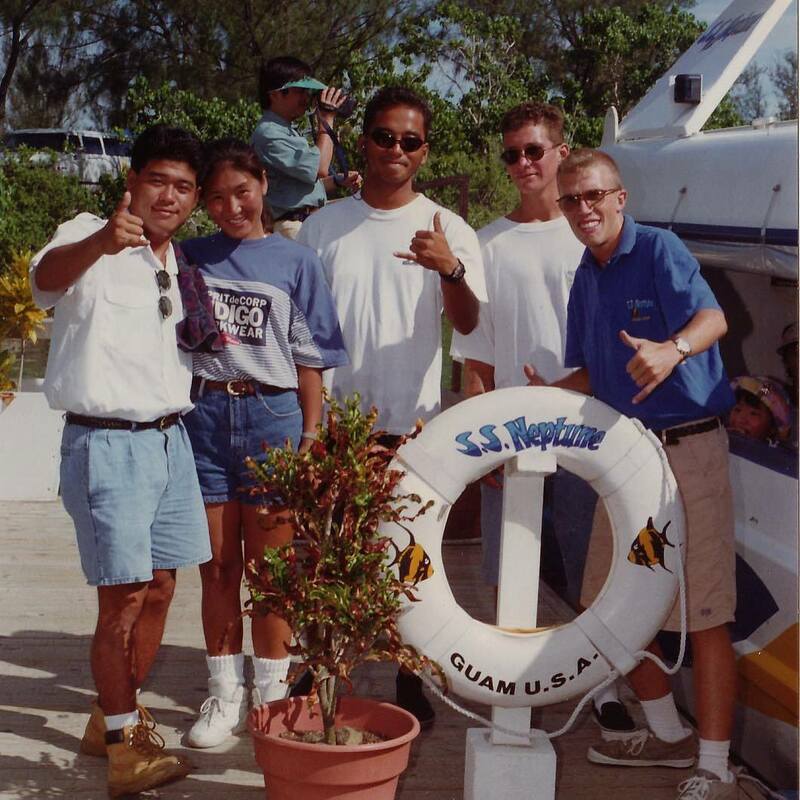 First artifact is me with co-workers at S.S. Neptune which is an undersea viewing boat which plied Apra harbor amongst US Naval vessels, Japanese sashimi-fetching boats, various pleasure crafts, the wreckage of John Wayne’s old yacht and a couple other tour operators doing scuba diving or similar tours to our 6or7/day tour. Basically, i’d greet the guests (pax) coming from hotel by coach bus (all booked by tour operators) and check off names – keep in mind, most of the guests were Japanese and most of the rest Korean – get them onto a shuttle boat (twin outboard, 26 ft or so) and give em safety briefing with the life jacket, tell em about mangrove and ww2 incidents in the harbor, few jokes blah blah and then tie up alongside the glass hulled Nepture “sub” and move em over and down into the viewing pod, put on a cassette of oceany sounds and hang out with the people while the boat came up off reef, tied off to a buoy and divers went down and chummed all manner of interesting and colourful fishes, and brought various sealife (namako, hitote…) and posed for photos through the portholes. 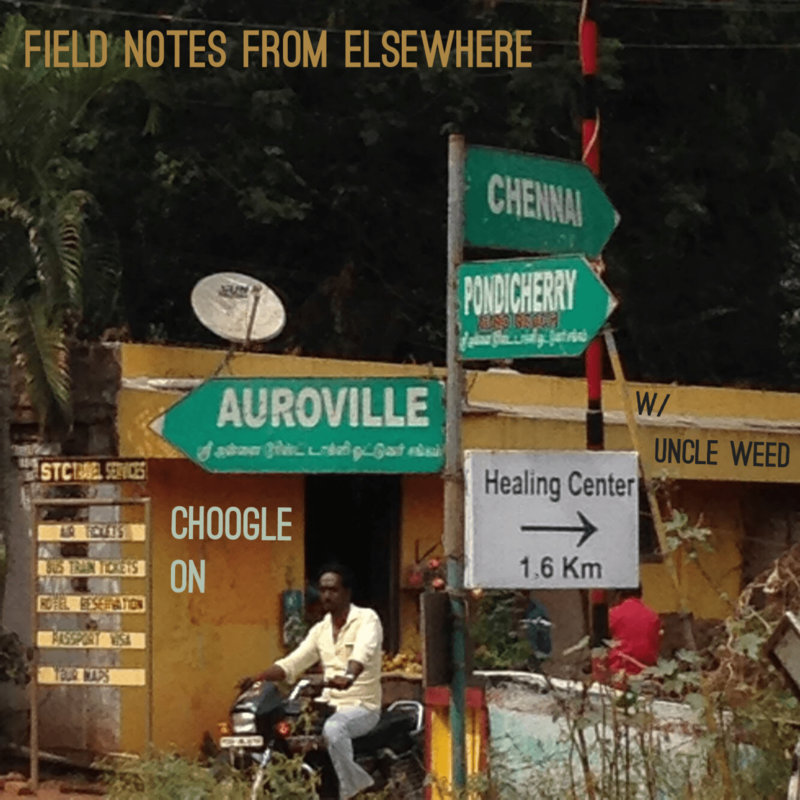 I took many photos (analog) and learned many strange vocabulary words. Sometimes when slow, i’d go dive for the last tour of the day which was a blast cause most all was under 20ft, a (relatively) prime location and freedom to bend normal dive rules with flips and tricks and goofballery. Then get em back on the shuttle, cruise harbor a bit, flip off other boats, listen in a radio chatter and maybe do some flowerstick juggling and then always this trick with a rubber snake which scared the sh!t outta people everytime. Related: Somewhere is a photo of me in the Pacific Daily News (Guam’s paper of record whose web traffic i suspect has increased exponentially of late) when the ship was dry docked and we were all marshalled into industrial, chemically, grunt work. Remember: Got my hair fulla toxic paint so went and shaved except for a Tintin-esque flair upfront. I was wearing a white jumpsuit and facemask. I added marketing tasks to my duties. All tourism is/was basically package tourist coming for short stays and would book “optional tours” from their provider at each of the dozens of hotels – mostly along Tumon beach which is Guam’s main tourist area. I’d go chat up the desk tour agents (all Japanese), restock brochures, help at signup events, industry events etc. Lost touch with all the folks i worked with there – we did put on an engaging tour and had some good party times together.